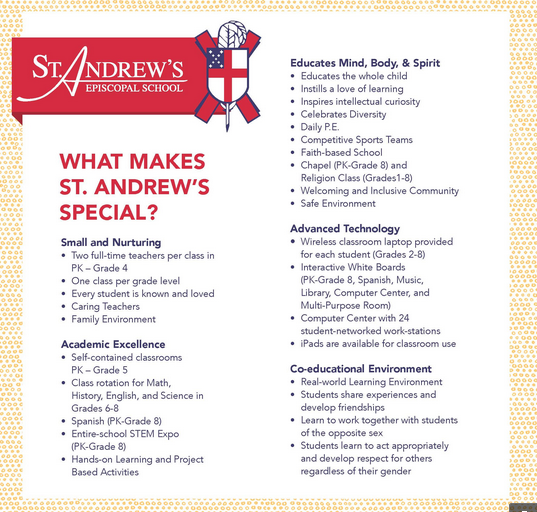 St. Andrew’s students learn in a dynamic, stimulating environment in which the use of interactive technology is integrated into the curriculum. Technology is integrated across the curriculum Pre-Kindergarten to prepare students for learning, living, and working in the 21st Century. Each student in Grades 2-8 is issued a wireless laptop that allows learning to extend beyond classroom walls. Additionally, each classroom in Grades 1-8 is equipped with a SmartBoard for interactive learning. A computer center with a state-of-the-art presentation system facilitates whole-class instruction and individualized learning. Using technology provides a variety of instructional approaches to reach children of all learning modalities, enabling more students to reach their academic potential. Technology affords students opportunities to access information, manipulate data, synthesizeconcepts and creatively express ideas, all while linking the classroom with educational resources within the building, the community, and the world. Using the Internet to learn and to communicate with others outside of the classroom fosters a greater awareness of and respect for others. Student-created blogs, wikis, and podcasts are just a few examples of how St. Andrew’s uses technology to help bring learning to life.